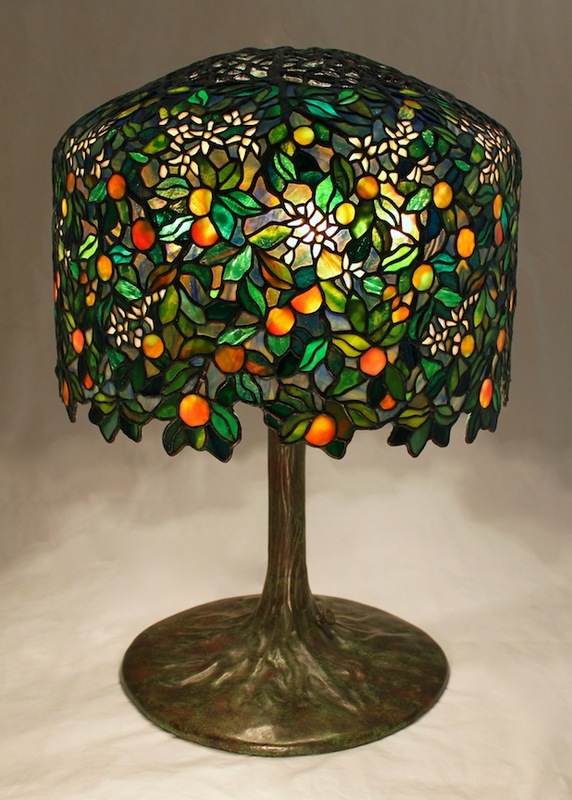 We have completed the 18″ Calamondin Orange Tree lamp. This lamp is an original Century Studios lamp design by Bill Campbell (see the previous post for our design inspiration). The lamp was designed to utilize the Tiffany 18″ Wisteria crown and form, and is now in a private Midwest collection. 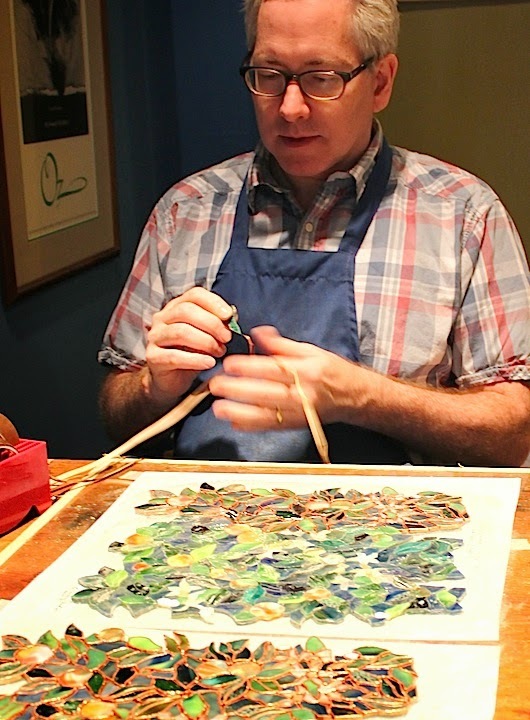 With just under 2050 individual pieces of glass, this shade is the most complex shade we offer – the Orange Tree has more pieces than the 18″ Wisteria and the 28″ Laburnum. Shades of this complexity will take close to 300 hours of production time to create. At different stages in the process, one of both of us will be working on the project. Bill did the glass selection for this intricate shade. Many glass colors and textures were carefully considered during the layout. The finished shade features a delicate balance of ring mottled, streaky, fracture/streamer, and ripple glass to give us the effects of light and shade we wanted. 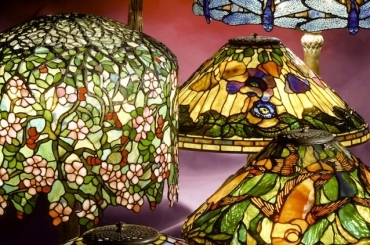 The background areas were cut from an old Oceana 900 series glass – this glass has the unique property of being sparkly and transparent when lit and opaque when unlit. Unfortunately, this glass is no longer being made by Oceana. 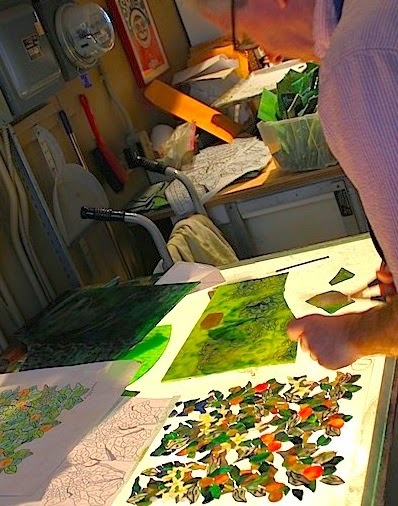 Once the glass was completely cut and fit to the pattern, the long process of foiling each piece of glass began. Foiling is a repetitive task that requires hand-eye coordination, but can leave the artist longing to get up and do something else. To break the monotony of this task, we often listen to books on CD while foiling. The soldering process is somewhat tricky on this style of shade. 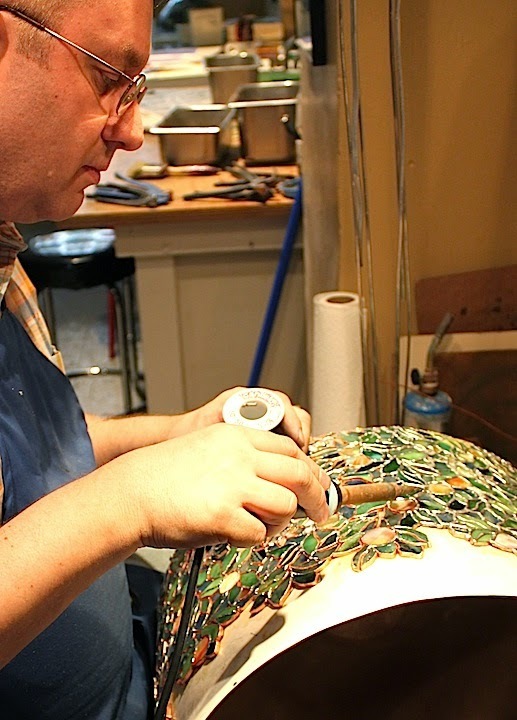 The large cast crown makes the shade top heavy, and it must be rotated and tipped while being soldered. Since molten solder runs downhill, the portion of shade being soldered must always face upwards! The final step in the soldering process is to attach a half round copper wire which conforms to the irregular lower edge of the shade. This wire is secured in place and then soldered to form a strong lower edge for the lamp. The shade is then ready for cleaning and patination.